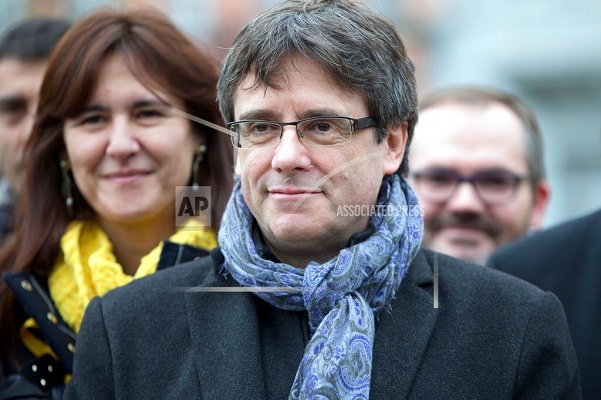 A German court ruled Thursday that former Catalan leader Carles Puigdemont can be released on bail pending a decision on his extradition to Spain, finding that the most serious accusation against him isn't punishable under German law. The state court in the northern town of Schleswig said it set conditions including a 75,000-euro ($92,000) payment for the 55-year-old to leave prison. It wasn't immediately clear when he would be released, though it appeared unlikely before Friday morning. "We will see each other tomorrow. Thank you all!" a message posted on his Twitter feed read. Puigdemont was detained on a European arrest warrant shortly after entering Germany on March 25. He was trying to drive from Finland to Belgium, where has been living since fleeing to escape arrest in Spain. He has been held at a prison in Neumuenster. Spanish authorities accuse Puigdemont of rebellion and misuse of public funds in organizing an unauthorized referendum last year on Catalonia's independence from Spain. German prosecutors argued earlier this week that the main charge of rebellion is equivalent to Germany's criminal offense of treason. German law calls for prison sentences for anyone who "undertakes, by force or through threat of force" to undermine the republic's existence or change its constitutional order. However, the court disagreed Thursday, saying Puigdemont can't be extradited for rebellion. It found that the accusations against Puigdemont don't satisfy the precedents set by previous German rulings, which call for a use or threat of force sufficient to bend the will of authorities. "That is not the case here," the court said in a statement. Judges will consider Puigdemont's extradition on the less serious charge of misusing public funds, meaning that he only could face trial for that if he were returned to Spain. They said that there was no indication he could be "exposed to the danger of political persecution." The court said that because Puigdemont can't extradited for rebellion he posed less of a flight risk and could be released on bail. If Puigdemont makes the bail payment and leaves prison, he can't leave Germany without prosecutors' approval, must inform prosecutors of every change of residence and report to police once a week, court spokeswoman Frauke Holmer said. In response to the German court's ruling, a Spanish official said the government in Madid respects judicial decisions "always, when it likes them and when it doesn't." The official, who spoke on customary condition of anonymity, said "Spanish justice will adopt the appropriate measures in the face of these new circumstances." Puigdemont's Spain-based lawyer welcomed the court's decision. "I always said that I had full confidence in the German judiciary," Jaume Alonso-Cuevillas wrote on Twitter, adding: "We continue." Isabel Mateos, a retiree attending a protest in the Catalan town of Figueres to call for the release of jailed separatists, reacted with joy to the news. "Truth to be told, we didn't expect it," she said. "We are totally happy and we'll celebrate it." Earlier Thursday, the Spanish National Court charged the former head of Catalonia's regional police and other regional security officials with sedition over their role in events leading to the banned referendum on independence. Judge Carmen Lamela said in an indictment that Mossos d'Esquadra chief Josep Lluis Trapero was part of an organized plan to seek Catalonia's secession, which courts have forbidden because the constitution says Spain is "indivisible." Trapero was hailed in Catalonia as a local hero for the handling of deadly extremist attacks in and near Barcelona last summer. But he then came under severe pressure when Spanish national authorities asked his regional police force to help prevent the Oct. 1 referendum, which triggered Spain's worst political crisis in decades. Trapero was demoted when the Spanish government assumed direct rule of the region. Two other members of the regional police and an official with the regional interior department were also indicted Thursday. Catalonia has been without a president or regional government since a regional election in December which produced a slim majority of pro-independence lawmakers in the Catalan parliament. Efforts to form a government have been hampered by internal discord within the separatist bloc and the legal challenges faced by presidential candidates.